Clearing Up the Confusion: Can You Get the Bonus on Both Chase Ink Cards? Many of you love Chase Ultimate Rewards points because of their flexibility and great transfer partners. And with the terrific bonuses available on Chase credit cards, we’ve been getting questions about them. For example, the Ink Business Cash℠ Credit Card and Ink Business Preferred℠ Credit Card currently come with BIG sign-up bonuses! But they are both business cards issued by Chase. So can you earn the intro bonus from both cards? One Business Can Earn You 2 Sign-Up Bonuses With These Chase Business Cards! I have the Chase Ink Business Preferred card already. Can I still apply for the Chase Ink Business Cash and earn a bonus? Thanks for the question, Tracy! The Chase Ink Business Preferred and Chase Ink Business Cash are considered separate products, so you can earn a bonus on BOTH cards! But just because you are eligible for the bonus that doesn’t guarantee you will be approved for the card. So I’ll go over the benefits of having each of the cards, as well as some of Chase’s application rules. The Chase Ink Business Cash currently has an intro bonus of $500 (50,000 Chase Ultimate Rewards points) after spending $3,000 on purchases in the first 3 months of account opening. That’s the highest ever welcome bonus we’ve seen on this card! The Chase Ink Business Cash is a cash back card. So you can only redeem points for rewards at a rate 1 cent per point. However, if you have another eligible card (such as the Chase Ink Business Preferred, Chase Sapphire Preferred, or Chase Sapphire Reserve card), you can pool the points and transfer them directly to any of Chase’s travel partners for potentially more value! 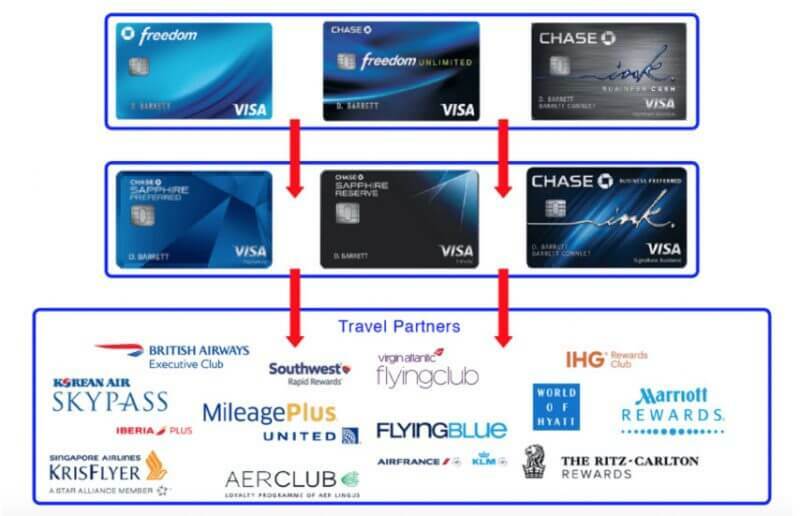 If You Have One of the Chase Sapphire Reserve, Chase Sapphire Preferred, or the Chase Ink Business Preferred Cards, Points Earned on Any Other Chase Ultimate Rewards Card Can Be Pooled Together and Transferred to Chase’s Travel Partners! The Chase Ink Business Preferred credit card currently comes with an intro bonus of 80,000 Chase Ultimate Rewards points after spending $5,000 on purchases in the first 3 months. That’s worth $800 in cash back, or $1,000 toward travel when you redeem through the Chase Ultimate Rewards travel portal. The card does come with an annual fee of $95 which is NOT waived for the first year. But it’s still well worth it given the large welcome bonus and the money saving benefits the card offers! Do You Qualify for These Business cards? Chase will look at more than just the usual approval criteria, like your credit score and a few other factors, when reviewing your application. Keep in mind, Chase will NOT approve you for most of their cards if you’ve opened 5 or more credit cards (from any bank) in the past 24 months (NOT counting Chase business cards and these other business cards). And when it comes to getting a small business card, you might be surprised to find out you may already qualify! If you generate income, whether it’s selling items on eBay, tutoring, or walking the neighbor’s dogs, you may qualify as a small business owner! Just several months ago, I was approved for my first ever business card – the Chase Ink Business Preferred! I claimed only $500 in annual income as a sole proprietor in operation for less than a year! I had no formal business license, and applied using my own Social Security number. In other words, you don’t need to be an executive at a large corporation to get a small business card. The Chase Ink Business Preferred and Chase Ink Business Cash credit cards are considered separate products. So it is possible to earn the sign-up bonus on both of them! The Chase Ink Business Cash is one of my personal favorites with its massive intro bonus of $500 (50,000 Chase Ultimate Rewards points) after meeting minimum spending requirements, no annual fee, and strong cash back in a variety of categories. The Chase Ink Business Preferred has an even higher sign-up bonus of 80,000 Chase Ultimate Rewards points. That’s worth $1,000 toward travel when redeemed through the Chase Ultimate Rewards travel portal, or potentially more if transferred to Chase’s travel partners. If you make extra income outside of your regular full-time job, you may qualify for these cards as a small business owner!